Gallery 2.3 (Skidoo) is now available for download! 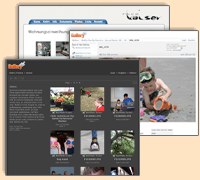 It's been almost 20 months since the last major release and Gallery 2.3 is packed with new features and enhancements. Major new features include: A much improved slideshow using PicLens to provide a rich, full screen experience; Comment spam filtering with Akismet; and configurable e-mail notifications. As always before you ask for help, please, please read the README -- we've made an effort to answer all of your questions there. Especially read the known issues section. Upgrading is quick and easy, but if you're upgrading from 2.1 or earlier there are a few things you should know first so be sure to scan the upgrading instructions. Go see what else is new and then download Gallery 2.3! Gallery 2.3 RC2 is now available for download! This is second and last release candidate before Gallery 2.3 will be complete. A release candidate helps users like you test out new features and provide feedback so that the final version has as many possible issues resolved. This release candidate includes the same security fixes as Gallery 2.2.6, so anyone using RC1 is strongly encouraged to upgrade to RC2. We have 6 different packages for you to choose from. You can read all about it on our Gallery 2 Download Page. As always before you ask for help, please, please read the README and the installation docs -- we've made an effort to answer all of your questions there. Also consider looking at the known issues. Upgrading is quick and easy. There are a few things you should know first so be sure to scan the upgrading instructions. Then head on over to the Gallery 2.3-RC-2 Forum Topic and let us know what you think! Gallery 2.2.6 is now available for download. This release fixes critical security issues, no new features have been added. Users of all previous Gallery 2 versions are strongly encouraged to upgrade to version 2.2.6 as soon as possible! The Gallery team thanks Alex Ustinov and Hanno Boeck for reporting the security issues through the right channels and will reward them with a well deserved security bounty. Since 2.2.6 is a security release, it shares the same installation requirements as 2.2.5. If you haven't upgraded to 2.2.x yet, please review the Gallery 2.2 release notes for highlights of changes and the requirements. Read on for more details and upgrade instructions. Fall 2008 Usability Project Needs Your Help! Usability is an area that we always seem to be a few steps behind in, but now is your chance to help us out to fix that. Two groups of students at the University of Michigan's School of Information are spending the semester working on ways to improve Gallery's usability, and they NEED your help! They are seeking some volunteers who are currently using Gallery and are willing to spend 30-45 minutes on the phone (or in person if you live in Ann Arbor, Michigan). As a small token of appreciation for your time, you'll get that warm fuzzy feeling for helping out an open source project and a $10 or more Amazon Gift Card. This is your chance to voice your opinion and help thousands of Gallery users around the world create more enjoyable photo albums. Please email us the team at gallery [at] ctools.umich.edu with your phone number and available time slots for an interview. They will be conducting interviews between September 12 and September 24 2008. In addition, if you happen to be in Ann Arbor, Michigan, please let them know so they can conduct a face-to-face interview. If you have friends who use Gallery and have comments on their experiences, please refer this message to them. The team would love to talk to them as well. If you have any questions or concerns, please feel free to email them or visit their project website at http://www.adamatorres.com/gallery-project/. Gallery 1.5.9 is now available for download. This release fixes several security issues. This version also resolves a handful of bugs found in Gallery 1.5.8. We strongly recommend that all users of Gallery 1.5.8 and earlier upgrade to this release to protect your Gallery installation. You can download Gallery 1.5.9 from the Gallery 1 download page on SourceForge. Upgrade instructions are available on our documentation site. Please discuss any issues specific to this release in this forum thread.